Established in 2015, Rye’s Town Steward team are employed by Rye Town Council to look after the environs of the town, undertaking maintenance where necessary. Their duties range from grass and hedge cutting in the Summer months, to repairs and repainting of benches and street furniture – along with much in between. The Town Steward liaises with, and reports problems to, outside agencies responsible for maintenance and repairs of public amenities in the town. They also undertake property maintenance on the Town Hall and other Rye Town Council-owned sites. Have a look at the Rye Town Steward Facebook page to see what they’ve been up to recently! Rye Heritage Centre is run by Rye Town Council under the management of Louisa O’Shaughnessy, employing five staff in total. It houses the Rye Town Model – a sound and light show based on a scale model of the town – as well as providing visitor information services, a gift shop, audio tours and delightful Old Pier amusement machines. The Heritage Centre is Rye’s only visitor information point since the closure of the Tourist Information Centre in 2015 and is a valuable resource in a town whose economy relies heavily on tourism. For more information click here. In 2017 Rye Town Council undertook to purchase a residential property in the town, with the aim of providing a discounted rental property for a local family. The purpose of the Discounted Accommodation Scheme is to provide cheaper accommodation to those with a strong local connection to the Parish of Rye in order to help them stay in – or move back to – Rye. Priority is given to households with the strongest connection with the Parish. The first tenants to benefit from the initiative moved into the property in Spring 2018. The Town Hall is owned and occupied by Rye Town Council. Since 2000 Rye Town Hall has also become one of the busiest licenced wedding venues in the area, with over 65 marriage ceremonies a year held here. As a succesful and popular wedding venue, the revenues from this business go directly towards the maintenance and upkeep costs of this Grade II listed building, reducing the burden on local Council Tax payers. In 1983, Rye Town Council gave East Sussex County Council £12,000 for a 999-year leasehold on the Freda Gardham Playing Field. Adjacent to Freda Gardham Primary School in New Road (A259), the Field has become the spiritual and physical home of Rye Rugby Football Club which secured a 25-year underlease in late 2004. The Field accommodates two full size pitches, a small training area, car parking and a clubhouse. Rye RFC has been particularly successful in attracting younger people of all ages – and both sexes – to take up Rugby. October 2005 was a momentous month for the town’s younger residents – it saw the opening of the long-awaited Rye Skate Park on the Cricket Salts, New Road (A259). Potential users were consulted on the design of the facility at every step of the way and were represented on the Steering Group. 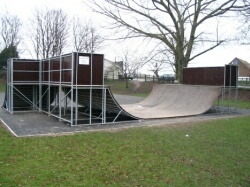 Delays in securing promised funding meant that only the base and main item of skateboard/bmx equipment could be installed at the outset; however, further equipment was installed as soon as the necessary finance became available. It is certainly popular: at weekends it is not unusual for there to be 50-60 users and spectators at the facility. Although the project was initiated and lead by Rye & District Council for Voluntary Services, Rye Town Council agreed readily to take over responsibility for the installation, management and maintenance of this valued facility. The Town Council has a lease from Rother District Council allowing it to occupy the site in return for the payment of an annual peppercorn rent. In addition to undertaking weekly safety inspections, the Town Council arranges an annual inspection of the facility by professional safety consultants specialising in play/sporting equipment. During 2018 a program of maintenance will be undertaken as the Skate Park reaches its 13th birthday. Rye Town Council co-ordinates a team of snow volunteers in the event of moderate to severe snow-fall. These volunteers are on stand-by to clear and grit pavements around the town, ensuring safe access for residents. This scheme functions alongside the provision and maintenance of rock salt bins around the town, for use on public roads and pavements. For more information on their location, visit our Useful Information page. If you would like to volunteer with snow clearance, please contact the Town Hall.